On November 27, 2017 the Governor’s Office of Planning & Research (OPR) released comprehensive updates to the CEQA Guidelines, including revisions for the analysis of transportation impacts called for by SB 743. 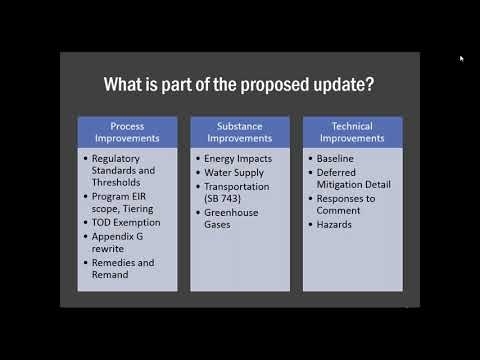 View OPR’s staff present key information about what the updates include and the timeline for implementation. Chris Ganson is a Senior Planner at the Governor’s Office of Planning and Research, where he leads California’s transition from LOS to VMT. He previously held positions at the Lawrence Berkeley National Laboratory, the World Resources Institute, and US EPA Region 9. Chris holds master’s degrees in City Planning and Transportation Engineering from UC Berkeley. Jeannie Lee is Senior Counsel at the Governor’s Office of Planning and Research (OPR). Prior to joining OPR, Ms. Lee worked as an attorney at the California Attorney General’s Office and Remy Moose Manley, LLP, primarily litigating CEQA and land use cases. Before entering the legal profession, Ms. Lee was an environmental planner, and is a member of the American Institute of Certified Planners.